A review of Byzantine Heritage, Archaeology, and Politics between Russia and the Ottoman Empire: Russian Archaeological Institute in Constantinople (1894-1914), by Pinar Üre. Pinar Üre’s thesis explores the intersection of politics and archaeology through the fascinating history of the Russian Archaeological Institute in Constantinople (RAIK), which operated from 1895 to 1914. Similar to the better-researched cases of European archaeological activity in the Ottoman lands, Russian archaeology was entangled with political vision, and reflected the Russian Empire’s efforts to become an equal player in the international scene through an investment in soft power. Unlike them, however, Russia attempted to bring forward a link with a different historical era: Byzantium. Through seven chapters Üre unfolds the story of the institutionalization and politicization of a largely overlooked (both at the time and in the scholarship) archaeological era, follows the establishment of RAIK from its first conception to its closure, and studies the role of scholars, Russian diplomats and Ottoman bureaucrats. The diverse archival material brought to light reflects the multiplicity of actors (including the Russian Embassy in Constantinople, under which the Institute was established, the Ottoman state, the Imperial Museum, Russian archaeologists and European institutions) and reveals parallel agonies and anxieties of two empires that saw the West both as a model and a rival. The author starts by situating her case study within the wider scholarship on the nationalist and imperialist use of ancient history in the 19th century in Chapter 1. Museums in the European metropolis and excavations in the periphery became the arenas where scientific research got entangled with the search for civilizational origins, the quest of cultural hegemony and even claims for “the right to rule” in the Near East (p.28). In dialogue with the work of, among others, Bruce G.Trigger (A History of Archaeological Thought. Cambridge: Cambridge University Press, 1989) and Margarita Diaz and Andreu Garcia (A World History of Nineteenth–Century Archaeology: Nationalism, Colonialism, and the Past. New York: Oxford University Press, 2007), Üre points out that Russian and Ottoman archaeology did not fall strictly into the opposing categories ‘imperial vs. local’; the establishment of RAIK is exactly one of those cases which highlights the complexity of perceptions, agendas and outcomes (p. 29). To understand how the idea for the establishment of RAIK was conceived, one has to grasp the story of the emergence of Byzantium as an attractive and instrumental area of research in the Russian Empire, a story which Üre undertakes in Chapter 2. Starting from amateur initiatives in the 18th century, archaeology in Russia gradually turned into a field of scientific study in parallel with the emergence of relevant institutions, such as the Department of Fine Arts and Archaeology in St. Petersburg University (1819), and the Imperial Archaeological Societies in St Petersburg (1851) and Moscow (1864), among others. Meanwhile, church archaeology lay in the interests also of the Holy Synod (p. 52). The rising interest in Byzantine heritage was connected to the issue of newly acquired Russian possessions in Crimea and the Black Sea; Slavic and Christian archaeology in these multicultural areas was important in order to enhance the legitimacy of Russian presence in the area, and Odessa became a major scientific and organizational centre for archaeological study (pp. 41-42). Unlike the uneasy relationship of Ottomans with the Byzantine past (the few 19th-century Ottoman references to Byzantium fluctuated between acknowledging the latter’s influence on the Ottomans and accusing it of decline and corruption), Russians claimed a direct lineage from the Byzantine Empire to contemporary Russia (p. 46). Such claims were in competition with similar efforts in Greece, and related to a revival of the perception of Moscow as ‘Third Rome’. Üre makes the point that Russian archaeologists objected to the paradigm linking cultural continuity with ethnicity; they “embraced a diffusionist approach and emphasized that multiple influences, primarily ancient Greek, Byzantine, Tatar, and Persian in addition to Slavic elements, shaped Russian culture” (p. 54). Russians saw Constantinople/Tsargrad as the symbolic centre of their cultural and ecclesiastical World, and after the Crimean War, Pan-Slavism started gaining ground in the political landscape (p. 67). Hence RAIK was not a unique phenomenon – it was part of a growing intellectual, academic and political milieu in the Russian Empire in which Byzantine studies acquired an instrumental role. Meanwhile, Ottomans had their own complex relationship with archaeology, which Üre tackles in Chapter 3. “In the first decades of the 19th century, Ottoman officials and rulers viewed foreign archaeological involvement with a lack of enthusiasm, if not outright apathy. However, towards the end of the century, this indifference was replaced by a growing concern and mistrust about the goals of foreign archaeological activities” (p. 93). From the Mecmua-i Âsar-i Âtika (Collection of Ancient Monuments, 1846, housed in St. Irene) to the establishment of the Ottoman Imperial Museum (Müze-yi Hümâyun) in 1869, and with the antiquities regulations of 1869, 1874, 1884, and 1906, antiquities gradually became a symbol of sovereignty, resulting to increasingly protective measures to regulate (and in the end prohibit) their export. At the same time, the establishment of museums and the initiation of native archaeological exhibitions (such as in Mount Nimrud in 1883 and Sidon in 1887) reflected the Ottoman Empire’s desire to project a modern identity. As Üre very eloquently puts it, “the museum building practice in the Ottoman Empire assumed the impossible task of representing a Euro-centric discourse of modernity while resisting it; glorifying an Ottoman imperial past, while embodying an anti-imperialist soul” (p.104). Having well introduced the specificities of the three contexts – the Western European, the Russian, and the Ottoman – in the three first chapters respectively, Üre then proceeds to introduce the case study: the establishment of the Russian Archaeological Institute in Constantinople (Chapter 4). She maps connections, negotiations and correspondence between scholars and diplomats, the positions of the Ministry of Foreign Affairs, the Ministry of Public Education, the Holy Synod, and the Tsar himself. Throughout the process, Byzantinologist Fyodor Uspenskii, the only director of RAIK throughout its existence, remains one of the main protagonists. RAIK was officially founded in 1894, acted under the local authorities and was controlled by the Ministry of Public Education. The primary sources testify to the argument that the establishment of the institute was connected with Russia’s effort to increase her voice with regards to the Eastern Question, to present herself as protector of Orthodox and Slavic peoples in Ottoman lands, and to secure the maximum influence on Ottoman territories in case of a collapse of the Sublime Porte against Western powers. This is reflected in the choice of areas of excavation and the institute’s links with Russian consulates around the Ottoman Empire, as well as Greek, Serbian, and Bulgarian diplomats. However, communication with universities and societies in the West and publications in Western journals reveal that RAIK was not limited to its political goals; it was to a significant extent also driven by its scientific mission (p. 167). Chapter 5 looks deeper into the practices of the Institute; despite gaining some trust and prestige in the beginning, demonstrated even with the exchange of gifts between RAIK and Osman Hamdi, throughout its existence RAIK would battle with suspicion, bureaucracy, and the continuous monitoring of its work. However it did manage to get some important permissions for excavation, allowing its archaeologists to work in Macedonia, Mount Athos, Bulgaria, Serbia, Asia Minor, Greece, Syria and Palestine. Interestingly, excavations in Macedonia taught the Russians that Slavic or Orthodox identities ceased to be unifying factors in the area, and that nationalism had taken over, proving that Russian’s role as a protector of Slavs or Orthodox was failing (p. 187). In another case, excavations in Bulgaria led to rivalries between Bulgarians and Russians, contesting Russian’s presence in the region. Other excavations boosted the confidence of Russian archaeology, like the Palmyra excavation in 1900 where Russia successfully competed with Europeans in areas where the latter dominated (Greco-Roman antiquity, Middle East) (pp. 196-197). However in the last years of its activity, due to the increase of control and suspicion, RAIK was restricted to specific areas, mostly close to Constantinople. Just before the Balkan Wars, RAIK’s interest in the Balkans reached its peak and a Slavic Department was established within RAIK in 1911, an event that Üre explores in Chapter 6. This decision demonstrated a will to collaborate with Serbian and Bulgarian scholars, who would be included in its administration. “It is no coincidence that the efforts to create a Slavic Department within RAIK occurred at a time when Russia was working hard to create a Serbo-Bulgarian military and diplomatic alliance, i.e. the later Balkan League” (p. 228). However, during the negotiations the Bulgarian participants backed out and the project was abandoned. The effort for the establishment of the Slavic Department coincided with the last time the Russian Empire sponsored an alliance between Bulgarians and Serbians, and testifies to the limitations of Russian policy-makers in fostering and leading Orthodox or Slavic solidarity. Chapter 7 deals with the end of the RAIK. With the outbreak of WWI, the Russian diplomatic corps in Constantinople left and the institute closed, leaving all its property behind. The status of RAIK property became a topic of controversy and was solved only by an agreement between Republican Turkey and the Soviet Union in 1929. RAIK carried out one last archaeological expedition in Trabzon, an area of a particular historical significance for Byzantinists, during its occupation in 1916-1917. However after the Bolshevik Revolution Byzantine studies lost their ideological justification; in 1920 RAIK was officially abolished by the communist regime, and its affairs were overseen by the Academy of Material Culture. Uspenskii continued his efforts to revive it until his death in 1928. Overall, the thesis succeeds in highlighting the multiple histories, meanings and functions of ancient remains, and their instrumentalisation for the shaping of identities, borders, and hegemonies at a regional or international level. It definitely makes a significant contribution to the scholarship on 19th-century archaeology and on the history of the Ottoman Empire. Furthermore, by demonstrating how cultural heritage can be subject to multiple interpretations by individuals, groups, or states in legitimization of present actions, it is also very relevant to understand present-day politics of heritage. London School of Economics and Political Science. 2014. 285pp. Primary Advisor: Dominic Lieven. 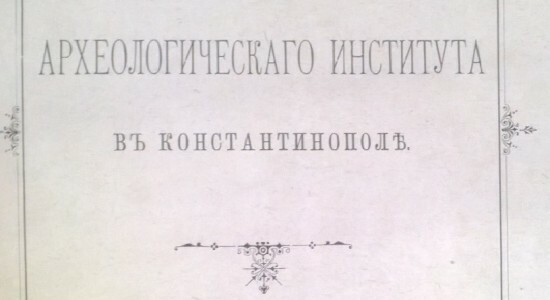 Image: Cover of the Russian Archaeological Institute charter. Archival reference: PFA RAN (St. Petersburg Branch of the Archive of the Russian Academy of Sciences), fond 127, opis 1, delo 1, pp. 272-275 (Charter of RAIK, 1894).